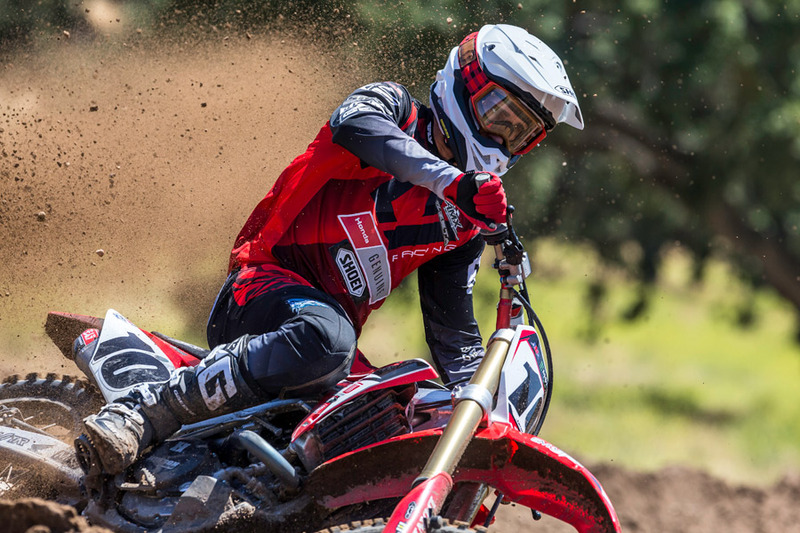 The world’s most evolved motocross helmet has evolved. Long overdue? Perhaps. But world-class engineering and quality take time. Fully loaded with next-level performance, safety, style and progression, the all-new DOT and SNELL approved VFX-EVO proudly boasts the SHOEI-exclusive Motion Energy Distribution System [M.E.D.S. ]—strategically engineered to reduce rotational acceleration energy to the head in the event of an accident. Completely reimagined and re-engineered without sacrificing an ounce of the quality and performance that have given SHOEI motocross and off-road riders championship-worthy confidence for nearly a decade, the all-new VFX-EVO has finally arrived. Worth the wait? We thought you’d agree. The proprietary, SHOEI-exclusive Motion Energy Distribution System [M.E.D.S.] 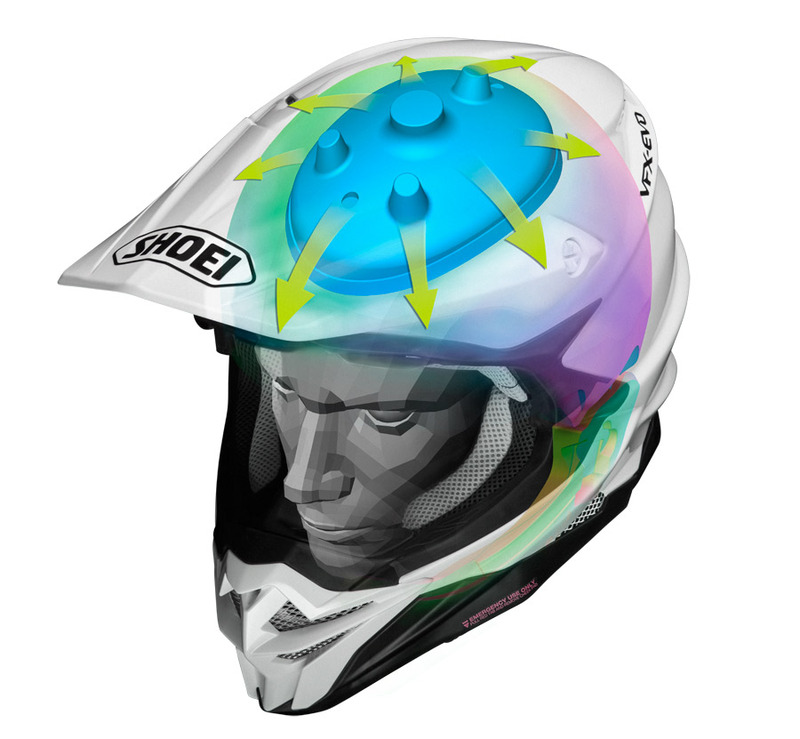 features a dual-layer, multi-density EPS liner that—in addition to preserving the lightweight, impact-absorbing characteristics of SHOEI’s traditional EPS systems—has been specially engineered to reduce rotational acceleration energy to the head in the event of an accident. Anchored by a larger center column, the inner layer of the dual-layer system swings during impact, allowing its three strategically-designed perimeter columns to absorb the energy. The end result is a significant reduction of rotational forces to the rider’s head without sacrificing an ounce of quality or performance. In addition to absorbing and reducing rotational energy thanks to the all-new M.E.D.S. technology, the VFX-EVO’s dual-layer, multi-density EPS liner provides enhanced impact absorption by utilizing varying densities of foam in key areas around the rider’s head. 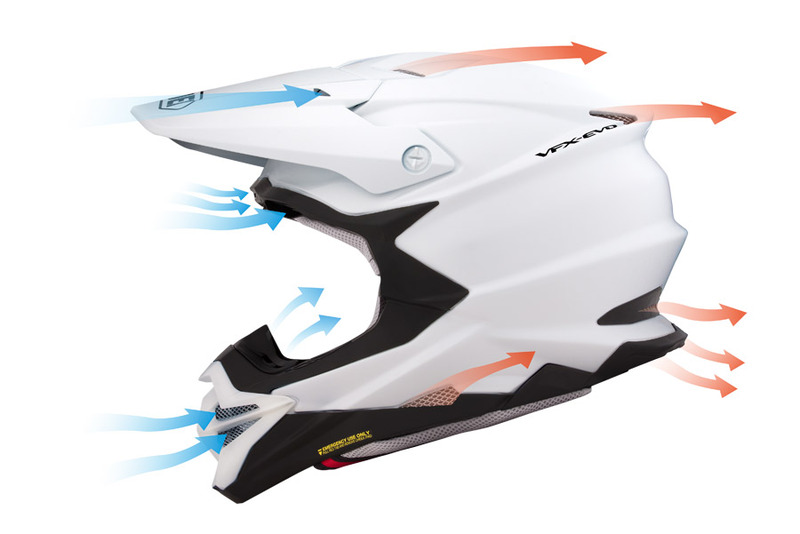 Channels between the EPS layers allow cooling air to travel unrestricted through the helmet, further enhancing the VFX-EVO’s superior ventilation characteristics. In addition to enhanced impact absorption and ventilation, the precise placement of multi-density EPS liner material yields a more compact, lightweight design. Few characteristics of a motorcycle helmet are as critical as its first-layer of defense, which is precisely why the all-new VFX-EVO features the SHOEI-exclusive Multi-Ply Matrix AIM+ Shell construction. Combining fiberglass with lightweight organic and high-performance fibers, the VFX-EVO’s proprietary AIM+ Shell provides optimal impact-absorption, strength and elasticity, and is available in four shell sizes to ensure a custom fit for heads between the sizes of XS-XXL. Through a new state-of-the-art shell forming technology exclusive to SHOEI, the VFX-EVO incorporates the aerodynamic advantages of a spoiler into its shell, and consistent shell thickness guarantees the proper strength and weight of each and every helmet. The large eyeport allows for a greater peripheral field of vision and facilitates oversized goggles. Additionally, the shell-integrated goggle channel has been optimized to form a perfect goggle retention system. Racing environments can be extremely hot and fatiguing, which is precisely why next-level ventilation performance was a top priority when SHOEI engineers conceptualized the VFX-EVO. Boasting sixteen (16) intake and exhaust vents in total [1 additional intake and 2 additional exhausts than the VFX-W]—all strategically shaped and located to maximize airflow and negative air pressure suction to the rear of the helmet—the VFX-EVO’s ventilating prowess is second to none. Along with optimized shell aerodynamics, cooling air channels in the VFX-EVO’s dual-layer EPS liner further enhance its world-class ventilation performance. The all-new V-470 visor has been specially designed to flow with the styling and functionality of the VFX-EVO’s aggressive new shell shape. With a massive field of vision and optimal roost protection still top priorities, the V-470 has been engineered to utilize the highest point of adjustability as its standard “home” position. Though aligning seamlessly with the shape of the shell when at the highest point, the V-470 also features a new flange mechanism to easily find the home position, and also helps to prevent unexpected movement during aggressive off-road riding. Made of a high-grade polycarbonate, the V-470 screws are extremely durable, yet capable of sheering off in the event of an impact to help prevent unnecessary forces to the rider’s head. Wind tunnel-refined and featuring larger openings to optimize the ability to pull cooling air in through the chin bar of the helmet, the VFX-EVO’s mouthpiece is equal parts style, functionality and safety. Reinforced by a strategically-placed strip of AIM+ shell material, the mouthpiece also features an aluminum mesh screen and a removable, washable foam filter to help prevent roost, rocks, mud and dust from entering the helmet. The entire chin bar of the VFX-EVO features high-quality EPS liner material for enhanced impact absorption. The VFX-EVO is equipped with a fully removable, washable, replaceable and adjustable 3D Max-Dry Interior System. SHOEI’s exclusive Max-Dry liner material absorbs and dissipates sweat and moisture twice as fast as traditional nylon interiors, and in combination with the VFX-EVO’s superior ventilation system, keeps racers and aggressive riders alike cool and dry during intense riding sessions. In addition to the Max-Dry material utilized on the forehead and cheek area, a soft yet durable fabric is applied to the lower part of the cheek pads for a plusher overall fit and feel. The VFX-EVO’s 3D center pad components are three-dimensionally shaped to match the contours of a rider’s head, allowing for an extremely comfortable fit while maintaining the firm hold necessary for distraction-free, aggressive riding and racing. Additionally, the VFX-EVO’s 3D center pads and multi-layer cheek pads are available in different thicknesses for a customizable fit. Borrowing technology originally developed for SHOEI’s groundbreaking VFX-W and X-Twelve racing models, SHOEI equipped the all-new VFX-EVO with its exclusive Emergency Quick Release System that allows emergency medical personnel to easily remove the cheek pads from an injured rider’s helmet. With the cheek pads removed, the helmet can be safely lifted from a rider’s head without creating unnecessary strain in the neck area.